Yiyun Li, “Kinder than solitude” or the past difficult to live with. Yiyun Li’s talent is now widely recognized; it is rare to witness such an increase in quality in such a short period of time. 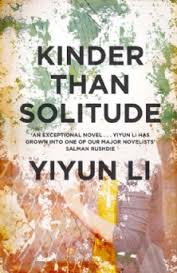 Her fourth book “Kinder than solitude” leads to many questions; it should be read and specially reread as this second novel has just been published in the English-speaking world (1) We have carefully followed the publications (2) by Yiyun Li: two interviews, the first one by phone six years ago was probably the first contact with the European press. 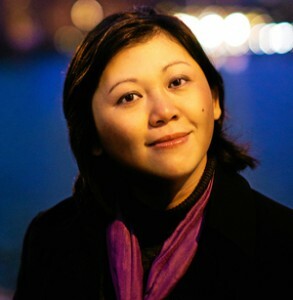 Yiyun Li is forty-one years old, she was born in Beijing and, after learning English, joined university to study immunology one year after the crackdown in 1989 on Tiananmen Square. One scholarship for scientific studies in the United States which, once completed, will allow her to enroll in a creative writing course in the well-known University of Iowa. She publishes short stories, collects literary prizes and a lucrative contract with the publisher Random House for her first novel and two collections of short stories. “Kinder than solitude” revolves around the poisoning of Shaoai, a young student excluded from university after the Tiananmen protests and who will die after twenty-one years in a vegetative life. What has happened, who has poisoned her? The author makes us understand very quickly that her purpose is to analyze the impact of this crime on the environment of the young woman, on her three friends, a boy Boyang and two girls Ruyu and Moran who will leave China for the United States where they will try to build a life. Yiyun Li explains that (3) the character of Shaoai is inspired by the case of Zhu Ling, a student from Tsinghua poisoned with thallium; she survived paralyzed and the student who shared her bedroom was protected by the political support of her parents. The Tiananmen massacre serves as a framework, an inevitable reference during a twenty-fifth anniversary, but occupies only a marginal role. Shaoiai, expelled from university, has been prevented of the possibility of any real social integration. Older than the other three, she is the character who leads them to take a position, but she is not a “sympathetic” character, selfish, contemptuous, aggressive vis-à-vis her parents and especially Ruyu, an orphan that they house. The latter shows no emotion and does not seem concerned by the deaths in Tiananmen Square. Moran and Boyang are not more involved and Boyang a few years later will concentrate on money and women. Yiyun Li is suspicious of politics and of comments that describe her as too much or too little political or even anti-Chinese! The tone of the book is very pessimistic about the country’s history and political struggles. “Every generation think they can achieve what the last generation have not. We’ve had enough revolution in our lifetime because of that thinking “(p. 147) “Trust me, being good means nothing in this country. Being right, and being on the right side of any conflict is the only way to stay safe. An egg never wins when it hurls against a rock “(p. 177). These are words ​​by the parents, but with no real challenge by the three young characters. Also no one is really innocent, everyone contributes to the system, suffers but benefits from it; that is why this book makes us share the collective guilt of the characters. The two women are not positive towards their environment but do not want to return to China; they enjoy far less social pressure. Ruyu has used her two marriages to settle. She does not suffer from the lack of love or friendship, “She had never agreed to love and has not expected his love” (p.166). Ruyu finally got free of her aunts and their God. Somewhat surprisingly, the religion is not mentioned in the United States while with Ha Jin it is a powerful social integration factor. Abandoning her God in China strengthened Ruyu: “Ruyu knew that she had to credit her grandaunts: by giving her a God, they had given her a position of superiority … by leaving them and their God behind, she had gone beyond destructibility “(p.163). For both of them, obtaining a residence permit or monitoring university studies are essential elements of their romantic strategy. This is one reason why Moran was not accepted by the children of Joseph. After graduation and employability, it is they who have decided to live in isolation and somewhat marginal. 3 / A great novel about the difficult relationship of the characters with their past. Boyang remained in China, a businessman whose marriage has failed, who is not attached to his mistress and is reluctant to engage with a younger girl. He’s jealous of a brilliant sister, the favorite of his parents and has not been able to choose as a teenager between Moran and Ruyu. He actually has a very strong sense of guilt vis-à-vis Shaoai. Joseph on his side, after the death of his first wife, tried to be loved by Moran but without really having a place in her life. Moran lives in her past, in her stories “perhaps if she kept these tales going, Joseph would one day forgive her stubbornness in choosing solitude, because he, kinder than solitude, was always here for her” (p.310). The author seems less interested in Ruyu; two features are essential for her: she can not imagine herself as a married woman, but in fact “being on her own- and not someone’s property- was the only thing she had wanted” (p. 274). After two divorces, Ruyu has in fact no life of her own and does not feel concerned by the life she leads. The construction of the novel is clever, between 1989 and the death of Shaoai twenty-one year later, between Beijing and the United States. Very little action, all in the masterly analysis of the characters that are complex enough to read again some chapters. Sometimes one is uncomfortable with some sententious comments often inspired by the tradition and common wisdom but the quality of the portraits will lead to forgiveness. (1) Yiyun Li, “Kinder than solitude.” Fourth Estate, London, 310 pages, 2014. 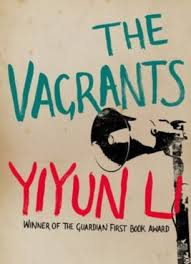 (2) Yiyun Li, “The vagrants”. Random House, 2006, 250 pages. 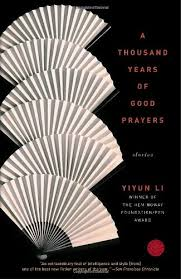 Yiyun Li, “A Thousand Years of Good Prayers”, 2006, 250 pages. Yiyun Li, “Gold Boy, Emerald Girl.” Random House, 2010, 220 pages.